Ugandas to store dagsaviser, Daily Monitor og New Vision kjører annonsekrig for tida. New Vision satser på å være den avisa som gir deg alle sidene av en sak, slik at du kan bestemme selv, Monitor hevder å kunne tilby «Truth every day». I det siste har kampanjene begynt å anta latterlige dimensjoner. 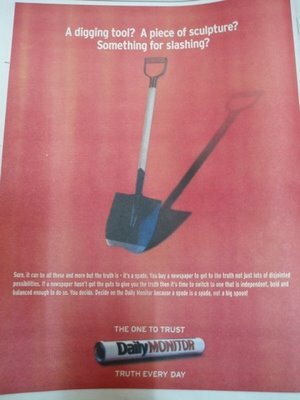 De følgende to eksemplene er fra Daily Monitor. Is it food? Is it a Vegetable? Is it a weapon? 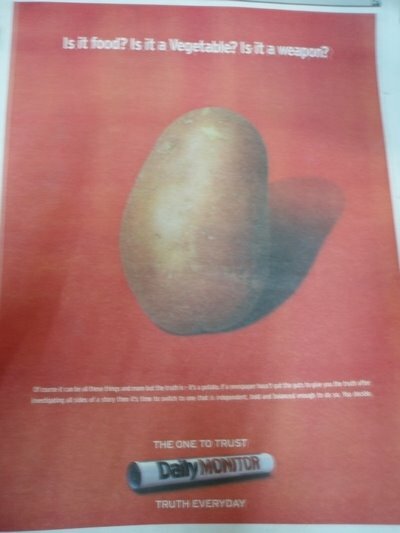 Of course it can be all these things and more, but the truth is - it's a potato. If a newspaper hasn't got the guts to give you the truth after investigating all sides of a story, then it's time to switch to one that is independent, bold and balanced enough to do so. You decide. A digging tool? A piece of sculpture? Something for slashing? Sure, it can be all these things and more but the truth is - it's a spade. You buy a newspaper to get to the truth not just lots of disjointed possibilities. If a newspaper hasn't got the guts to give you the truth then it's time to switch to one that is independent, bold and balanced enough to do so. You decide. Decide on the Daily Monito because a spade is a spade, not a big spoon!